2. GENERAL CRETIREN FOR SELECTION. The phase I and Phase II of the system consists of 193.16 km route length out of which a major portion, i.e. 142.31 km (125.23 km in Delhi and 17.08 km in NCR) of the system is supported on the viaducts, 6.5km at Grade and 44.35 under Ground. i) Allowing free flow of vehicular traffic on the already congested along with chosen alignment,ii) Paucity availability of land,iii) Existence of charted and uncharted utilities,iv) Problems to pedestrians,v) Problems to existing residents, andvi) Environmental impact including noise and vibration etc. Present project report describes the comparison of various technique and methods adopted in construction of the viaduct and examines together the various factors influencing the design. The design solutions are presented together with methods adopted to comply with very tight design and construction period. I. A comprehensive multimode mobility study, taking into account the various transport means like Rail/Sub urban / Metro/Roads/Feeder services, is required to be conducted to finalized the change over points. The elevated corridor is planned by DMRC generally to cut across fairly densely built up areas by virtue of its need to serve these area “Hence its impact needed sensitive treatment and assessment. Thus, the sometimes conflicting issues of operations and using requirements, construction appearance, environmental impact, including noise and vibration had to be included in the overall assessment of the most appropriate materials and form of construction. Environmental impact including noise and vibration etc. The structural form adopted for the elevated Corridor (i.e. 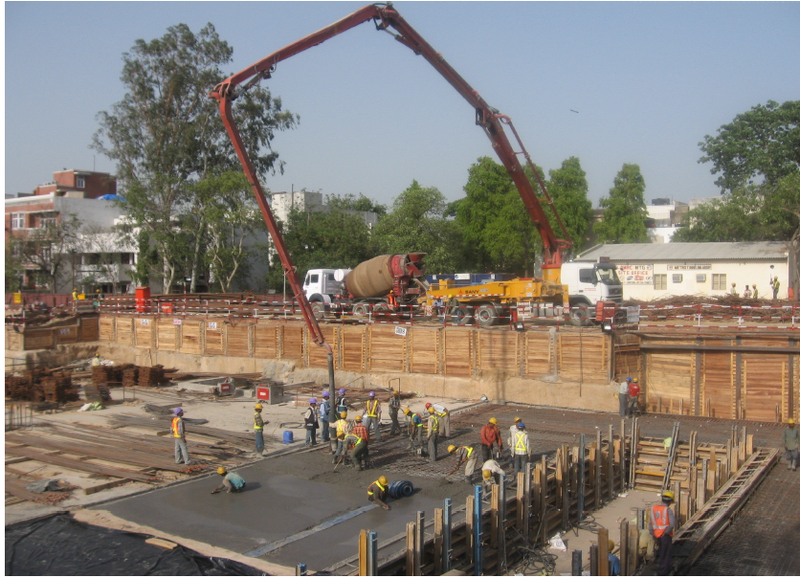 viaduct) constructed so far by the DMRC is comprises of Pile foundation - Group of bored piles of dia 1.0 m , 1.2m, and 1.5m. · Transportation of long girders having spans more than 20m by trailor will pose serious problem in crowded city roads and sharp curves. · Operation of Two cranes to place girders in position will require traffic block during night for a number of night which may not be acceptable to traffic police and if agreed upon they will cause inconvenience to general public. · The availability of casting yard at suitable location as choice will be governed by shifting, lifting and transportation of girders. · Cast in situ construction, Where ever required, is time consuming and cause inconvenience to public. i) Larger spans have to be cast-in-situ which will cause false work, shuttering and concreting problemii) It can not have curved surface in playiii) It is not idle suitable for carrying spans which are unavoidable in city due to road crossings, utilities and other constraints. 4.3 WHY SEGMENTAL CONSTRUCTION IS PREFERED? If a decision is taken to go for single girder for two tracks then segmental casting is only option. It can be managed from 3 to 4 casting yards for one full leg of corridor located at available land which may be a few km away. ii) Very fast Progress can e achieved. iv) Segments can be cast and stacked parallel to pile and pier construction activity. v) Launching speed is very fast. vi) Cause minimum disturbance to traffic as segments can be fed at selected location and launched with help of launched spans moving it on completed deck to avoid lifting of segment from trailor positioned on road. vii) It can have curved surface in plan and is suitable for carrying span lengths. viii) In case some span have to be skipped due to local problems segmental casting has got flexibility. ix) Cost of construction may be slightly more to start with but if it is adopted on large scale it may come down and likely to be comparable with conventional construction. The superstructure is be erected entirely from below using an under slung erection tackle. 1. BRIDGE CONEDesign by Bombay based firm, moves pier to pier no ground support is required. 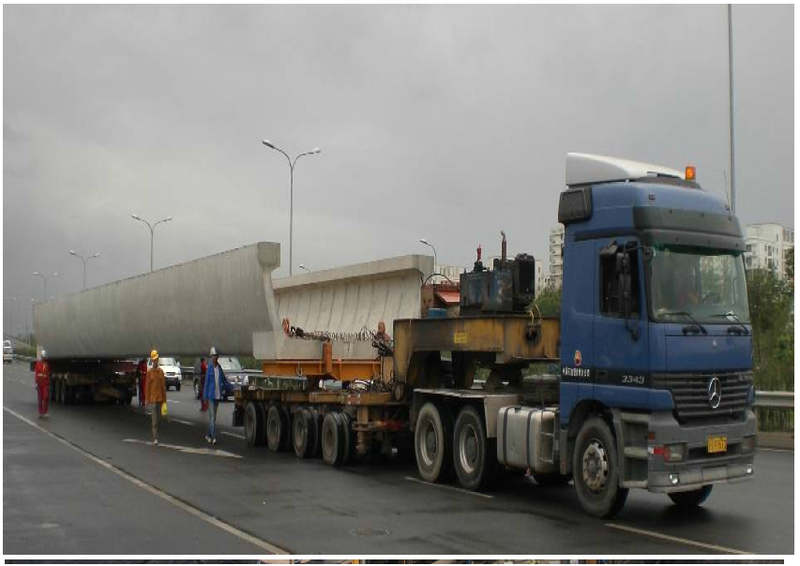 Design by Italy based Firm .Nois ing girder is supported on ground, can not be used where R. L. as road vehicle can not be moved. Much Safer and very use full for Railway x-ings. Design by Bombay based firm, front leg is moved ground, can not be used where x- ing is required. of requirement of airport link. i) Two types of super structure was adopted. a) 25m long span U girder. -Concrete shear keys are provided at top of pier cap which restrain the movement of deck in transverse direction and acts as topper in longitudinal direction. A gap of 25mm between deck and shear key each side of the deck is maintained to allow thermal expansion of the deck. Drain pipe is located with in solid pier to avoid aesthetics problems. The top of deck soffit slab is profiled so as to collect run off water at middle of slab by providing a cross slop of 1%. Two no of drainage pipes at each end of U girder span have been provided on top of the pier cap which will connect to the drainage pipe in pier. – Cost effective as the weight 11t/m where as it is 16t/m in segmental box, overall savings is about 10% . – Fast un erection it takes less than one day cycle in erection of one span compared to 5-6 days required of conventional segmental span. – Aesthetically better looking as no joints. - 4m pier cap head against 6 to 7m for the box girder. - Gives a clean soffit & is preferable aesthetically. - Segmental construction can achieve very fast progress. Segment can be cast & stacked parallel to pile & pier construction activity. - Cost of construction may be s lightly more to start with but if it is adopted large scale it may come down & is likely to be comparable with conventional construction. - In case of some problem, if a few spans have to be skipped, segmental cast has got flexibility. A method statement is detailing the procedure of casting various elements of the structure. It is to be prepared by the contractor and get it approved by the client or their nominated consultants well before starting the construction work at site. the construction activities ,so as to get the work done with desire progress and quality. 7.1 Preambles: Casting of proposed U –Shaped girders of 25.0 m nominal length for Air Port express link of DMRC. 7.3 Reference Drawing:- Details of the drawings illustrate the complete casting and stacking scheme is to be given under this head. 7.5 Mould: Under this head Details of casting beds along with details of Approved reference Drawing, Sequence of fixing the various shutters is to be given here. 7.7 Rebar cage- No of Jigs required to achieve the planned progress per week and frequency of checking the condition of jigs as mutually agreed to be mentioned here. 7.8 Rebar cage – method of cutting and bending of re-bars, their checking procedure and shifting to casting bed is to be given here. 7.9 Cover block- Procedure of their casting, required shape (semi circular) is to be given here. 7.11 Fixture in girder – here the details of all the fixture to be provided are to be given. 7.12 Curing of the Girder- method and time period of curing , alternate method etc. 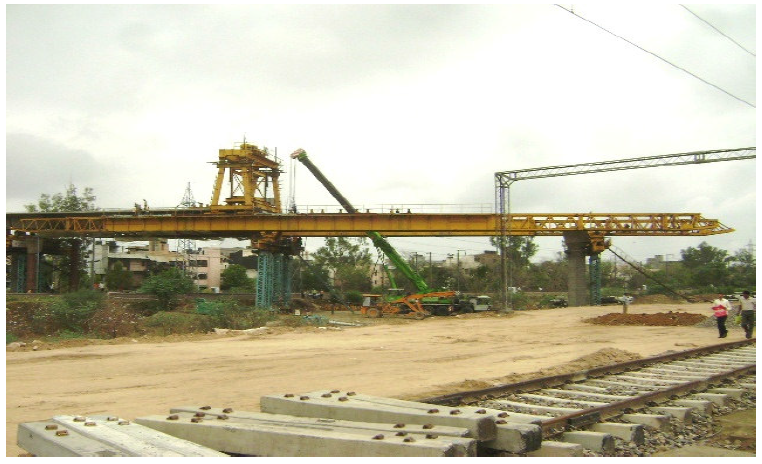 7.14 Lifting of girder- Procedure of lifting and placement as per drawing with required no of pre decided type of cranes to be given here. 7.15 Inspection before dispatch to the erection site. Enclosures - For example Risk assessment, inspection test plan formats etc. The Engineer shall be entitled to audit any aspect of the system Compliance with the quality assurance system does not relieve the Contractor of any of his duties, obligations or responsibility in the Contract. At locations where pollution level has already exceeded the permitted level or is on higher side, every construction activity needs very close scrutiny to ensure that there is no further environmental degradation. Planning for method of construction and type of materials used plays a very vital part in containing the adverse environmental impact. a) The pre-stressing technique, was used extensively on the elevated track to bind the segments, reduces the weight and volume of structure thus correspondingly reducing pollution in manufacturing, transporting, and assembling, etc. b) Use of high strength concrete to optimum level substantially reduced not only transportation and erection cost but also mitigated pollution. Similarly, by appropriate use of ‘pre-stressing’ in concrete structure, economy is invariably achieved as there is reduction involume from 20% to 40% in most of the cases, which in turn results in a positive impact on environmental during construction. 1. Tyre washing facility at site exits,2. provision of oil separators,3. Recycle of bentonite and reuse /recycle of curing waste productive.4. Use of dewatered water etc.5. Maintenance of equipment is mandatory and requirements for use of silent DG sets is made more stringent.6. Segregation of wastes at sites was initiated and handling of waste as per legal requirements was introduced.